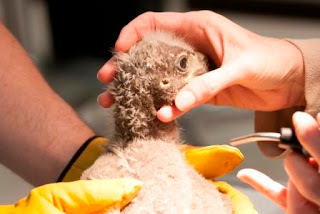 The Raptor Center was overwhelmed with the support and interest that you all had for little Harmon. Thank you to all who followed his story with us. What did Harmon's story teach us? The Raptor Center works quickly with our partners at the state and federal levels to assist raptors when and where needed. 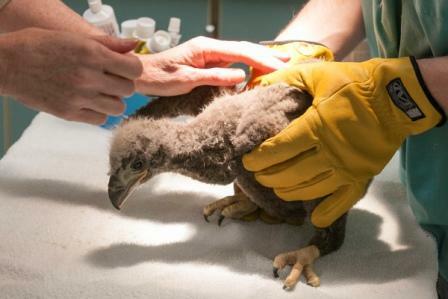 While our dedicated staff applies its unique expertise to care for an eaglet in trouble, they are also always learning more about population issues. We never cease to be astonished at the power of these magnificent creatures to capture attention. And we are all deeply grateful for the financial support many of you provide that allows us to do this amazing work. If Harmon makes it to his first birthday he has a fair chance to make it to 15-20 years. He won’t have his white head and tail and yellow beak and eyes until he is 5 years old. Eagles generally do not breed until they have their adult plumage. When Harmon reaches adulthood, he will hopefully find a mate and nest. Just like in the nest he is growing up in, bald eagles like large tall trees. Harmon’s nest is about 75’ high in a large cottonwood tree near water. Harmon has a better chance in making it around humans than his recent ancestors did. Currently Minnesota has the highest population of bald eagles in the lower 48 states (approximately 1300 pairs counted in the 2006 survey). 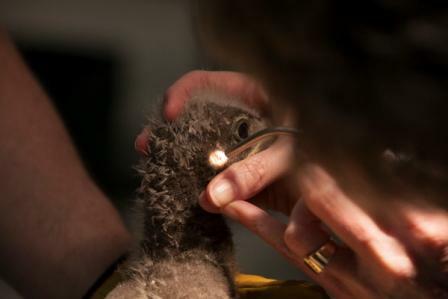 It has been a rocky road to get here – by 1963, persecution and environmental contaminants had reduced the population to 487 breeding pairs in the lower 48 states. What can you do about the unnatural dangers to make it a safer place for Harmon and all of the other eagles fledging from nests this year? 1) Donate time or money to organizations like The Raptor Center that provide care for raptors or protect habitat. 2) Use chemicals according to the instructions or not at all. Chemicals applied to our lawns and fields have a way of finding their way into our waterways and then into the fish that reside there. 3) Save and protect habitat. Bald eagles need large trees, preferably close to water for their nests. Become active at the township and city council level to make your feelings known about protecting natural areas. 4) Also make sure you vote and know what your representatives are voting on that impacts bald eagles and other wildlife. 5) Use alternative ammunition to lead for hunting. The main source of lead poisoning in bald eagles is the spent ammunition in gut piles from field dressed deer. At the very least, bury the gut piles so they are not accessible to eagles scavenging for food. We thought we'd share a few more photos with you of Harmon's clinic visit with TRC. These photos were taken by Ben Wilson. The two last photos are of clinic staff checking Harmon's ear openings. Thanks for your work in rescuing Harmon and other wildlife! Love Harmon and all of you too !!!! Could you comment on his growth these past two weeks back in the nest since his rescue. Seems the growth has been remarkable. Is he right on target? love Harmon! So glad that this intervention was possible, and saved his life. Love watching Harmon's growth--and the M/D eagles as well on the MNBound website. Thanks for all you did for him and continued success in all the Raptor Center does. We have donated each time we visit--and will continue. Thank for all you do and for intervening for Harmon! Bless You ALL!! Harmon couldn't possibly have been in better hands! Way to go, TRC! To all - many, many thanks for your kind responses, and your interest and support. 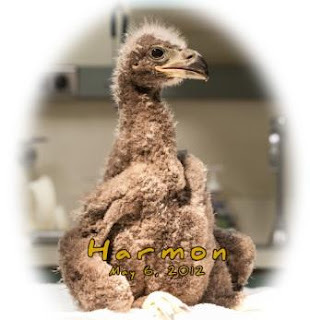 Harmon appears to be growing normally - baby birds grow at any amazing rate and he needs to be the size of his parents by the time he fledges (2 more months). It is hard to judge weight gain in a fuzzy chick through a web cam, but everything does appear to be fine. any updates on Harmon ?